Sometimes using an app just feels right. The experience is bang on, the UI fits your taste and the usability makes sense. For me, radio app Anchor is one of those such experiences. 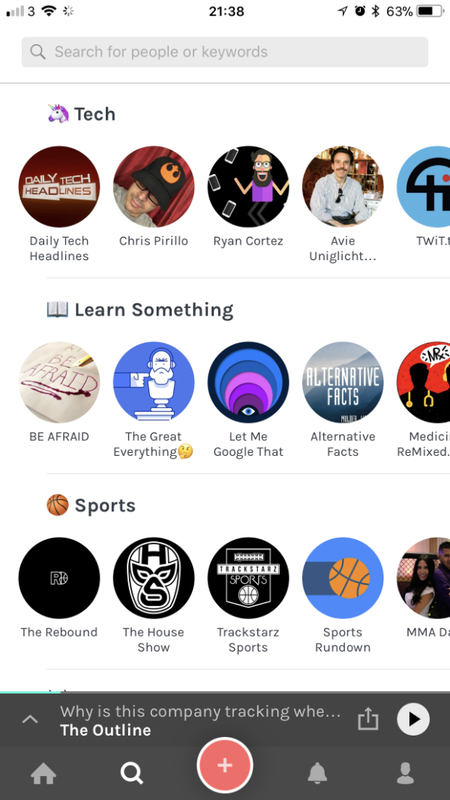 It almost feels like a disservice to pigeonhole Anchor into just a radio app as it feels like much more than that. It has taken podcasting, a more convenient and accessible audio publishing format than radio, and made it even more convenient and accessible. But rather than just populate the world with fluff, let’s dig into specifics about what Anchor does so well. Onboarding is generally a rarely memorable process and yet it’s a hugely important step for successful customer acquisition, and if done incorrectly, can cause your product to be dead on arrival. Thanksfully Anchor is one of the best, and simplest examples of user-onboarding I have can remember, but what it does to elevate the process is largely due to Anchor’s main hook; its audio. As we go through the process the audio has a friendly, approachable tone that doesn’t narrate every word on screen Ron Burgundy style, instead it complements the copy with a conversational tone. In some cases the narrator actually gives you extra information to put ease you through the journey, and why shouldn’t it? Audio is the central feature so it should be used to its fullest capacity. “Hi. What’s your name? Full names work best, but you do you.” While the voiceover relays two statements, ”First we’ll need your name so we know what to call you. 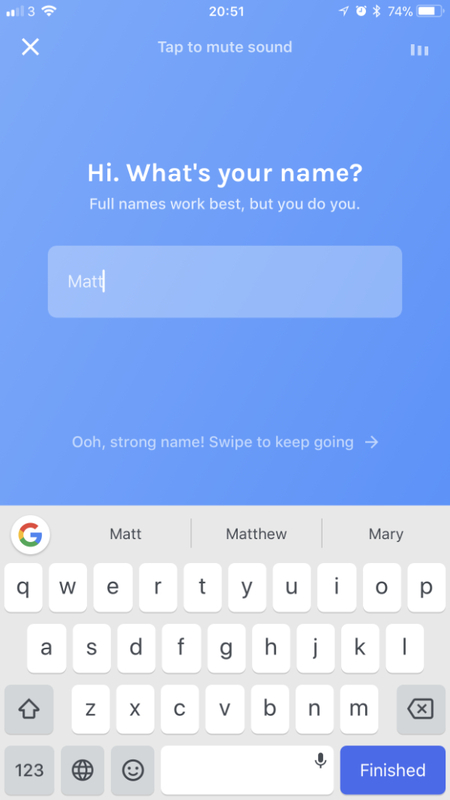 You can always change this later.” Notice the difference in how through alternative messaging, the narrator can cover a lot of ground to put the user at ease, even for something as small as entering your name. 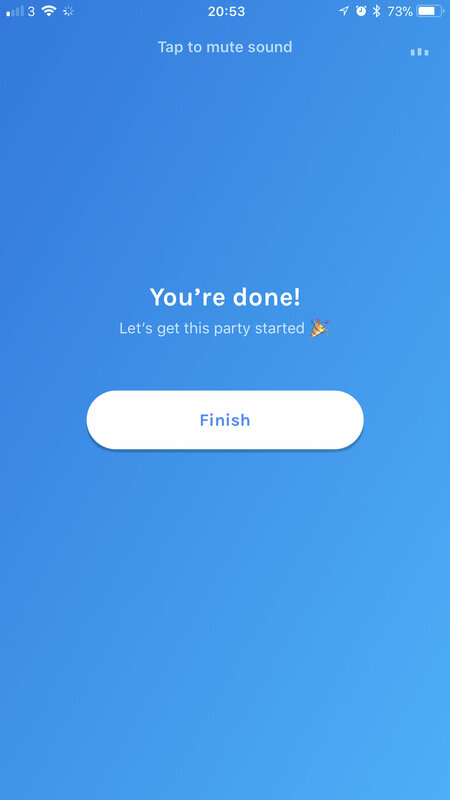 This theme carries on throughout the onboarding process and really serves as a great reinforcement to user actions along the way. The soundtrack (which also carries through to the main app) acts as a good primer for the experience to come, and helps make it a more engaging procedure. Anchor deserve extra credit for achieving a fine balance between simplicity of guidance, and transferring confidence to the user. For example, after a name is entered into the field on screen 2, a prompt is revealed guiding the user to swipe to get to the next page. This reinforcement is shown again on the following page once the user enters their email address. But look, what’s this? 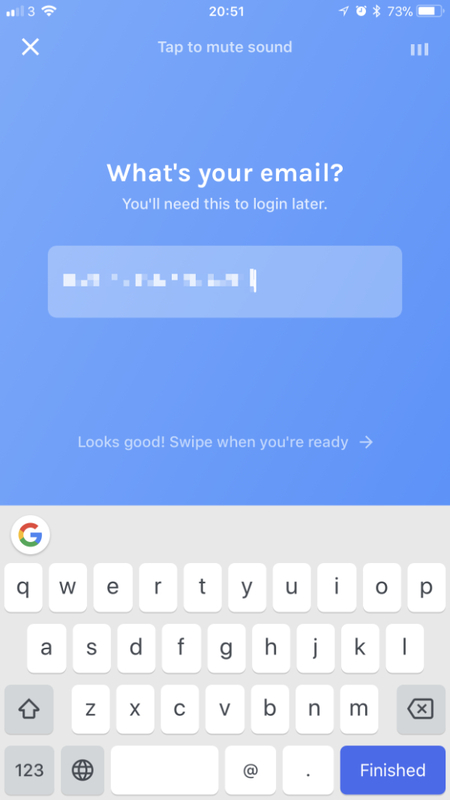 Where is the reinforcement on the password screen? Reducing the prompt to the arrow only is a great reduction of information for the sake of clarity. The user knows the behaviour, the journey is well underway, and unnecessary copy is stripped away once it’s served its purpose. Bravo 👏. Once you’re up and running you’re met with a circular carousel that is positioned in a perfect arc that’s conducive to browsing in an experience reminiscent of the iPod click wheel. There’s a reason why that format worked so well, and it’s great to see this used in a modern UI, albeit in a more subtle manor. Speaking of subtle, it’s here where the onboarding continues in a charming and unexpected manor. The first time a user presses on the ::Daily Rundown:: element, they should be greeted with a personalised and friendly welcome telling them more about what to expect from the experience. The personal greeting is something you’ll hear daily in the rundown, and yet for something so little, it garnered a big reaction from me. One thing I don’t expect from large publishing platforms is personalisation by name, and yet this is something that Anchor have done really well. Clicking through to a station reveals a simple interface with a text headline and a variety of buttons, some familiar, and others not so. As you’d expect, a play, skip forwards and backwards, and favourite buttons are all present, but there’s also a selection of listener participation button. 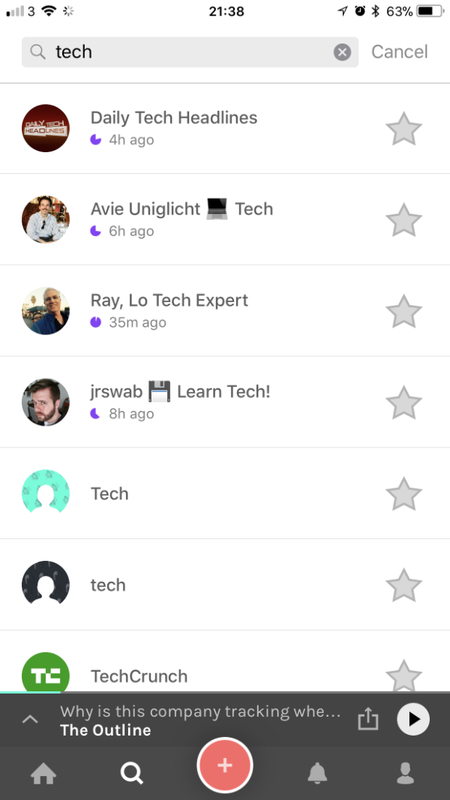 A chat button allows for messages between listeners which, although messaging apps are at an absolute saturation point, makes sense in this instance for contextual conversations. But it’s the other two options I find particularly interesting; an applause button and a call-in option. While applause may not be a necessary feature, it’s a really charming addition to overlay the actual recorded programming with the audio equivalent of a clapping emoji 👏. As for call-in, this is really handy feature that makes total sense in our interactive, super-chat, instant feedback digital landscape we’re living in. Although messages have to be featured by the presenter which is a level of censoring that I feel is probably justified for this type of app. One nice feature that’s consistent right through from the onboarding process to station navigation is swiping. Navigating through clips within the station is as easy as swiping left and right. It’s important to keep this behaviour familiar as it builds up a sense of confidence for the user where progression means swiping left and going back is literally the opposite action to going forward. Search is one area where I think the experience needs work, and this isn’t a criticism of Anchor specifically, it’s more a critique of search in general. Anchor employs familiar implementation that I’ve seen many places before; a collection view with genres stacked vertically but stations populate. a horizontal scroll. Now having just applauded Anchor for their consistent scrolling behaviour above, it sounds like I’m going against my own principles, but this is why it’s not targeted purely at Anchor’s implementation. Anchor is restrained in their implementation and doesn’t overextend their horizontal results, however I’m not sure having a separate view with a long list of vertical results helps mediate the issue of trying to find targeted, relevant or quality content. Search and navigation are two of my big bug-bares at the moment and I feel I need to explore this further so keep your eyes open 👀 for a post in the future. When it comes to publishing, I’ve never been one to use myself as the point of focus. My alter ego is a street photographer and i’m very much more suited to being behind the lens. When it comes to audio, I’m definitely not a natural speaker, and that is exacerbated by listening to your own voice if you’re not used to it. However, self-critique aside, Anchor takes away all the friction by amounting the effort needed to that of a regular phone call. With the simple lift of your phone to your face you’re recording your podcast with as much effort as it takes to speak to your parents (I mean in required action, not in physical or mental endurance). Whilst you can press a button to start the recording, you’re not even required to do that. The proximity sensor seems to invoke the recording function so the barrier to entry really is as low as possible, barring someone actually holding the phone to your face. Again, Anchor is all about the touches. Once you’ve recorded your content, Anchor allows you to add one of their backing tracks underneath your audio which really does make it sound more engaging. Another fantastic inclusion is the automatic generation (if selected) of a transcription video. This takes longer to create but it’s a great touch and a double thumbs up for accessibility 👍👍. Although these segments are created in the Snapchat mindset of small clips butted up together in a timeline, you can actually collate selected clips into a permanent podcast style episode that lives in your channel. It really feels like the best of both worlds for audio content. To wrap up, I’m a big fan of Anchor. I think the app itself oozes charm and has an approachable design language that considers the user journey from onboarding right through to content publishing. I feel that apps targeted at creatives can have the tendency to pile on the feature set for the sake of list length, but with Anchor nothing feels unnecessary. The team have taken what is now a mature podcast model and changed it up for the Snapchat era whilst still remaining faithful to the original format. If there was one criticism I have it’s about user adoption. With the podcast model thriving, I feel there may be difficulty attracting the major players to Anchor. Saying that, maybe that’s not the intention. Both can exist in the same world, it would just be great to see more support on there from some bigger players who cannily the…Anchor? 🤷‍♂️. Still, it’s early days yet and I’m certainly rooting for you guys. Great work team!